Bust of Fernanda Wittgens by Marino Marini, (left), Attilio Rossi's portrait of Fernanda Wittgens (middle), Bertel Thorvaldsen's marble monument to the painter Andrea Appiani (right). 'Nym' chair & 'Inox round' table (foreground). 'Modus' modular sofa, 'Jazz' chair & 'Inox square' table, all by Pedrali. Photo by Michele Nastasi. 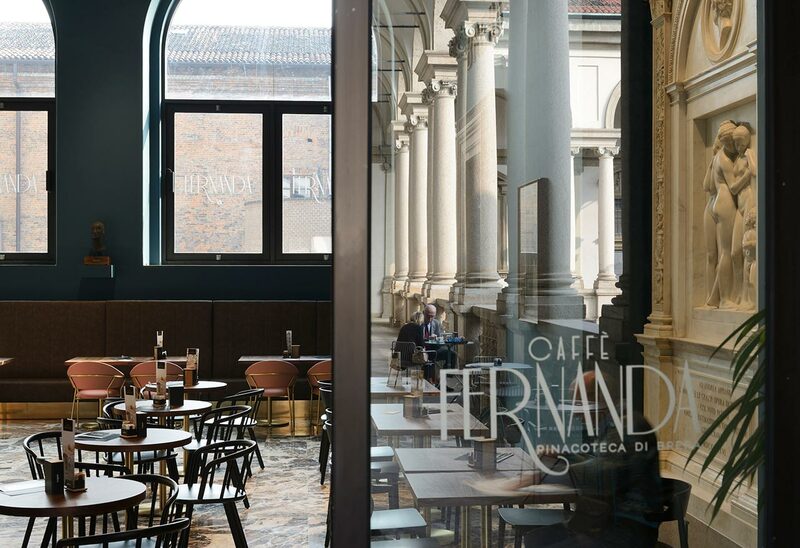 Located in the former entrance hall of Milan’s Pinacoteca di Brera, the city’s foremost picture gallery, home to one of the leading collections of Italian paintings in the world, Caffè Fernanda welcomes the museum’s guests in a revamped space that embodies the institution’s venerable legacy and drive for renewal. 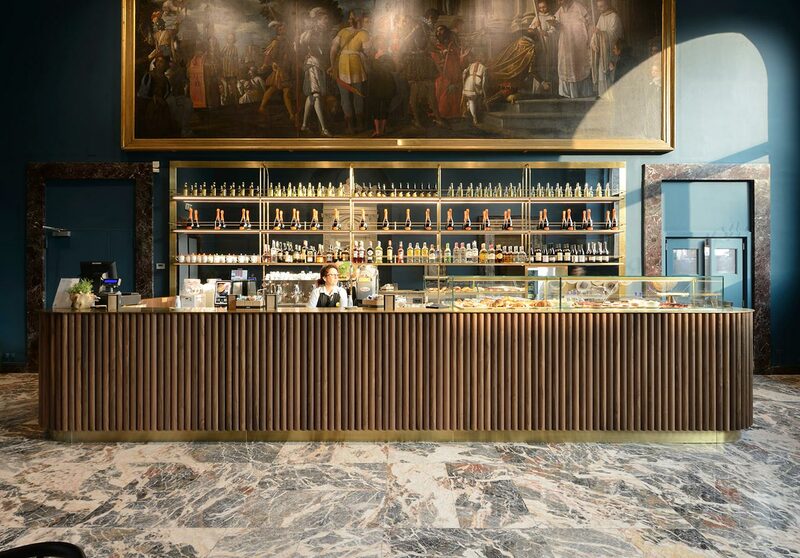 Taking its name from the Pinacoteca’s visionary former director, Fernanda Wittgens, who managed to re-open the gallery following its partial destruction during World War II, the café is part of a larger, 3-year project entailing the redesign of the gallery and its art collection, designed by Milanese architecture practice rgastudio to echo - both aesthetically and in terms of curation - the renovated gallery rooms. Built in the 17th century by baroque architect Francesco Maria Richin on the remains of a monastery, Palazzo Brera was initially a Jesuit college before becoming (in 1773) home to a number of the city’s leading cultural and scientific institutions, including the Accademia di Belle Arti, a national library, an art school, an observatory and a botanical garden. 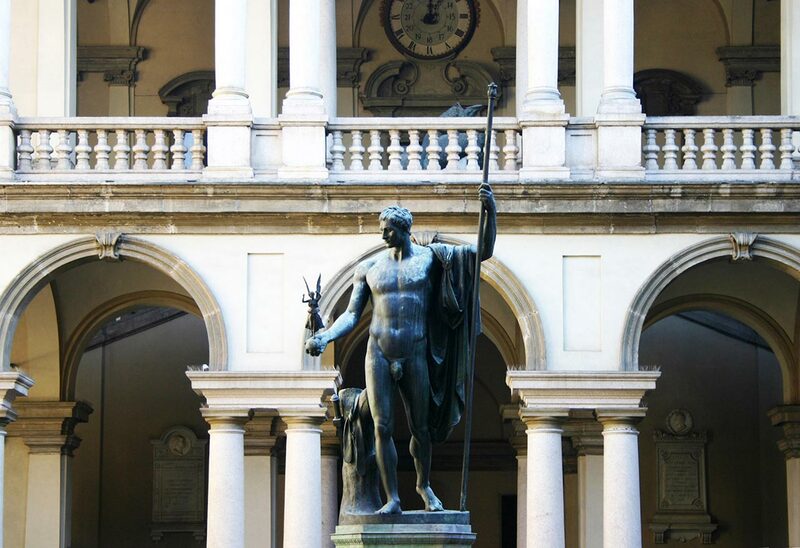 Pinacoteca di Brera was founded by Napoleon a few decades later in 1809 to house the most important works of art from the Italian territories he had conquered. During that time the Palazzo was remodeled in the neoclassical style by Giuseppe Piermarini, one of Italy’s leading Neoclassical architects, before being heavily damaged in 1943 during aerial bombings. 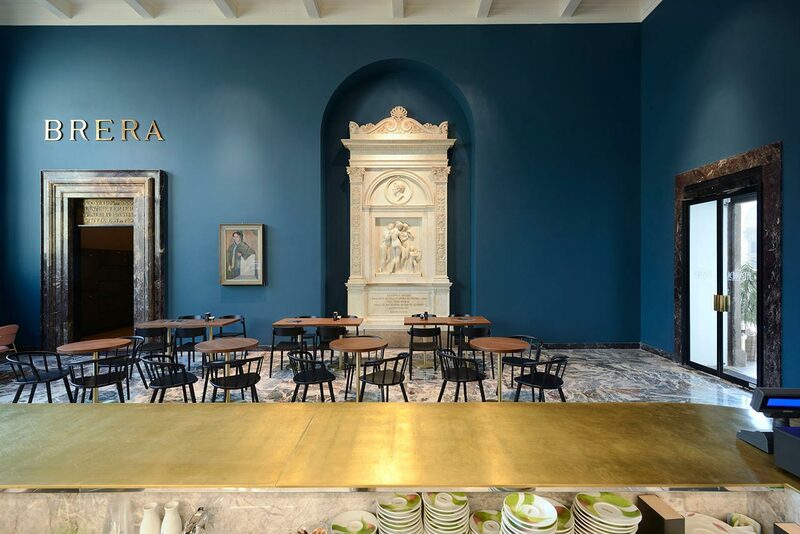 It took its determined director, Fernanda Wittgens, and talented architect, Piero Portaluppi, for the museum to reopen in 1950, both of whom the new café pays tribute to. 'Nym' chair & 'Inox round' table (foreground), 'Jazz' chair, 'Modus' modular sofa & 'Inox square' table (background), all by Pedrali. Photo by Michele Nastasi. Pietro Damini's expansive 17th century painting of ‘St. Bernard Converting the Duke of Aquitania’. 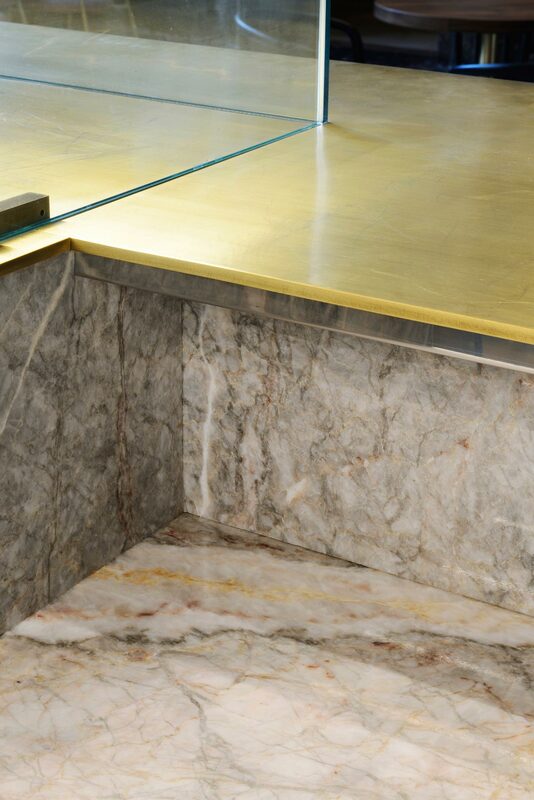 'Nym' chair and 'Inox round' table (foreground) by Pedrali. Photo by Michele Nastasi. Pietro Damini's expansive 17th century painting of ‘St. 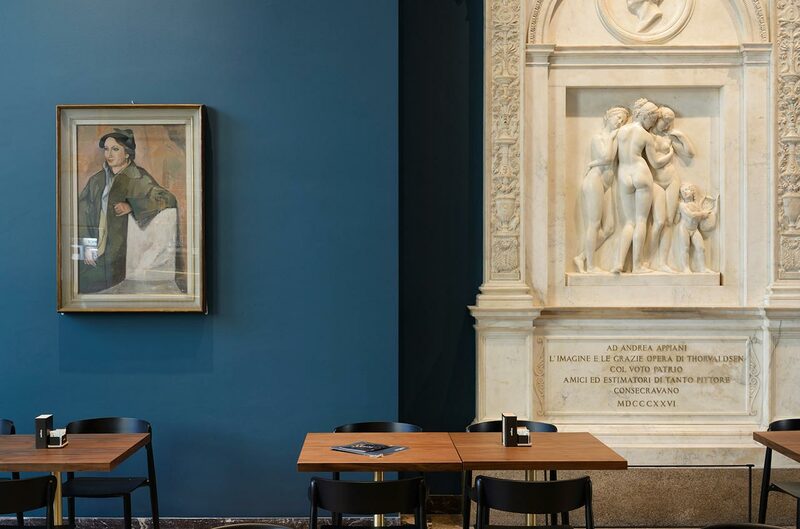 Bernard Converting the Duke of Aquitania’ majestically hangs above the bar, while Bertel Thorvaldsen's 4-metre high monument to the painter Andrea Appiani, which depicts in relief the Cupid and the Three Graces, dominates the other side of the space, its white marble seductively standing out against the deep petrol blue of the walls. Smaller in size but as enticing is the bust of Fernanda Wittgens by Marino Marini along with her portrait by Attilio Rossi. Bertel Thorvaldsen's marble monument to the painter Andrea Appiani depicting Cupid and the Three Graces (right), portrait of Fernanda Wittgens by Attilio Rossi (left). 'Nemea' armchair and 'Inox square' table by Pedrali. Photo by Michele Nastasi. 'Jazz' armchair by Pedrali. Photo by Michele Nastasi. Bust of Fernanda Wittgens by Marino Marini. 'Jazz' armchair, 'Modus'modular sofa, and 'Inox square' table, all by Pedrali. Photo by Michele Nastasi. Besides perfectly complimenting the artworks on display, the rich blue colour of the walls has been selected as a harmonious counterpart to the warm hues of the gallery rooms, as well as the peach-blossom marble floors and the Lepanto-red marble door frames, both prominent features of Portaluppi's postwar design that have been left intact. 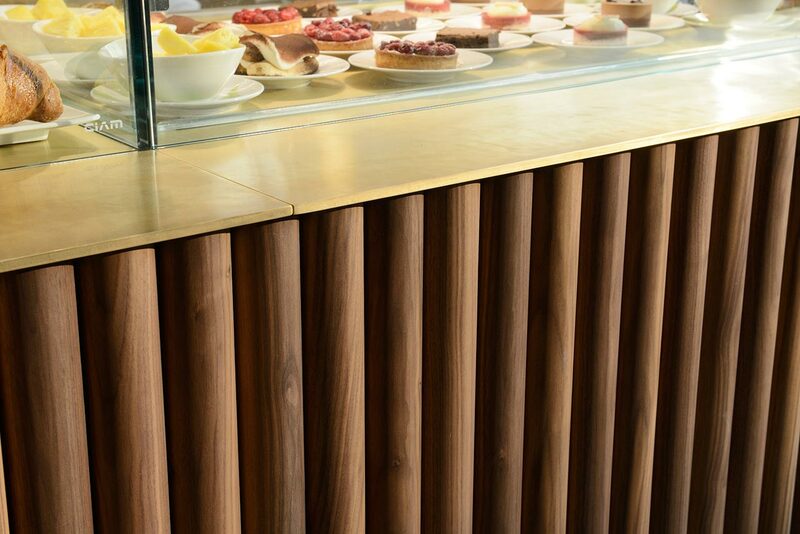 It also makes for a great backdrop for the antique-brass and canaletto walnut bar counter whose design evokes the ribbed wooden furniture from the 1950s. 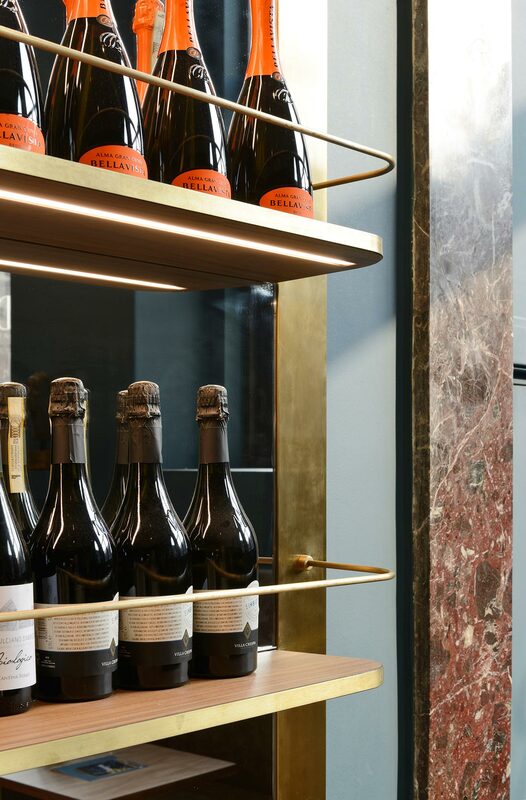 The counter’s extremely thin brass top is picked up by the slender shelving set against a large mirror that evocatively reflects the artworks on the opposite side of the room amid the glowing bottles. 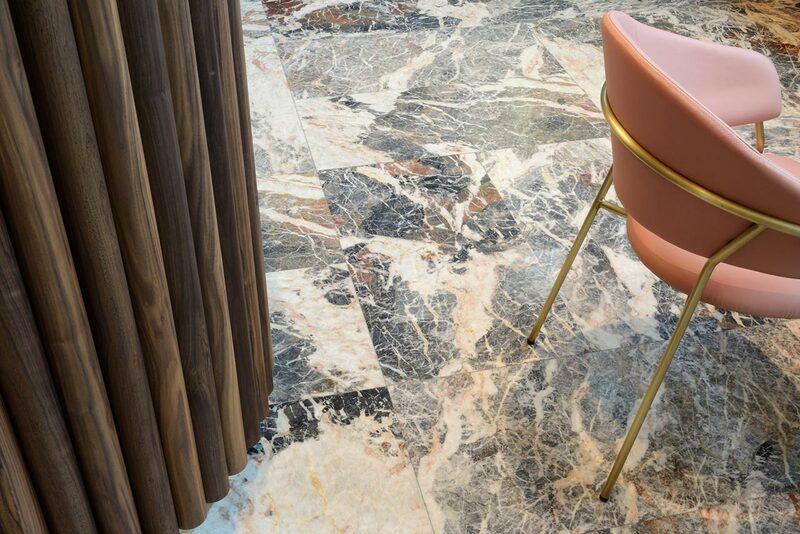 Brass and walnut are also featured in the café’s elegant square and round tables by Pedrali, while the modernist armchairs, also by Pedrali, combine brass with soft pink upholstery that accentuates the colours of the marble surfaces. 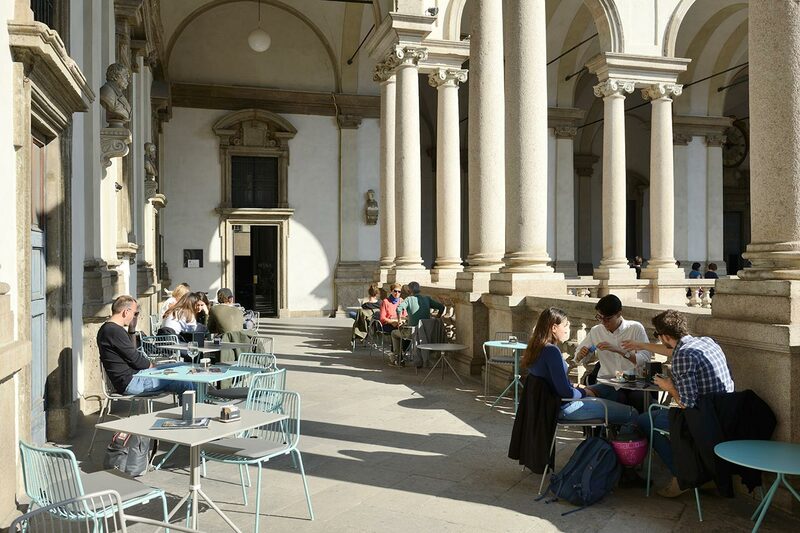 The pink armchairs are the perfect spot to sit to admire Marini’s bust of Fernanda Wittgens while the tables by the bar offer good views of both Rossi's portrait and Francesco Hayez's famous Kiss, which is located in the final room of the Pinacoteca, further solidifying the fact that the café has been designed as an integral part of the museum itself. Bertel Thorvaldsen's marble monument to the painter Andrea Appiani (right) and a portrait of Fernanda Wittgens by Attilio Rossi (left). 'Nemea' & 'Nym' armchairs, 'Inox square' & 'Inox round' table, all by Pedrali. Photo by Michele Nastasi. Photo by Michele Nastasi. On the left Francesco Hayez's 'Kiss'. 'Nolita' chair and 'Nolita' table by Pedrali. Photo by Michele Nastasi.